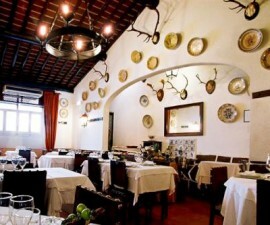 When you go in search of a good restaurant in Évora, Travessa de Santa Marta is probably the best place to start. This delightful cobbled street in the heart of the Old Town is full to bursting with eateries serving the rustic, traditional cuisine of the Alentejo region of Portugal. Much of the street is taken up with the whitewashed buildings dating back some 500 years to times when the Church was in its heyday in Évora, and formerly belonged to the convent of Santa Marta. The vaulted ceilings of the restaurant give a feeling of space to what is actually a small and cosy dining room, with wooden tables and chairs packed in closely together, conducive to fun and conversation both with your own party and fellow diners. Taverna Restaurant is owned by Luis and Rosario Dias, with Luis running the show front of house and Rosario behind the scenes in the kitchen, preparing mouth-watering dishes with fresh farm ingredients from rural Portugal. Luis is a jovial character, happy to chat and make friends with his customers. 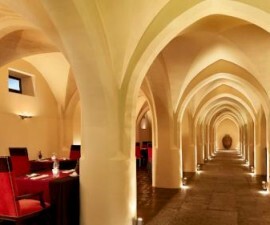 Do take the time to ask him for recommendations not just from the food menu but also from the wine list which features a number of tasty Alentejo wines. With main courses ranging from seven to ten euros, Taverna restaurant is a good option for well-cooked local food without a hefty price tag. Start with chickpeas and salt cod, one of Portugal’s specialities, or opt for local olives, wild mushrooms or Paio, the delicious rustic sausage that is very popular in Évora and the local area. Pork features heavily in Alentejo cuisine and is well represented on the menu here. Try the slow-roasted pork spare ribs that literally fall off the bone, or the migas, the traditional dish made from fried and mashed corn bread with seasoned pork and chunks of orange. Lots of custard-based traditional desserts provide an excellent option to finish your meal. 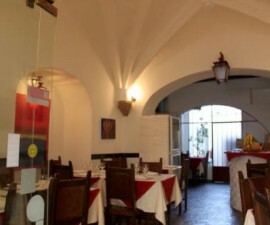 One of the biggest draws of Taverna Restaurant in Évora, however, is its set-price fixed menu of the day. For just €5.75 (prices are correct at time of writing but do check on arrival) guests can enjoy a three-course set meal with a complimentary drink. The set menu usually features a bowl of home-made soup with bread, veal or pork for main and fruit or ice cream for dessert, all washed down with a complimentary glass of liqueur or a soft drink. This may not be Michelin-starred gastronomy, but Taverna Restaurant is sure to leave you with a lovely taste of Évora at its best.